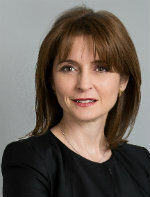 Sorana Baciu is a State Secretary with the Ministry of Economy, Commerce and Relations with the Business Environment where she is responsible for the Industry, Competitiveness and Corporate Governance sectors. She has extensive expertise in general management, corporate strategy, and corporate finance, with over 20 years of experience in the private and public field in senior positions. Sorana has had an international career in investment and commercial banking (within ING Bank and Porsche Finance Group Romania), as well as in oil & gas (within OMV Petrom S.A). In October 2014 she established a consultancy practice focusing on business performance improvement, change management and turnaround, and investment advisory. In the past year she was a non-executive director for the largest gas producer in Romania, Romgaz, and the Chair of the Audit Committee. Sorana is a committed civic activist and has held different positions within non-profit organizations and was ranked number 19 in Forbes' 2016 list of Romania's most powerful women.